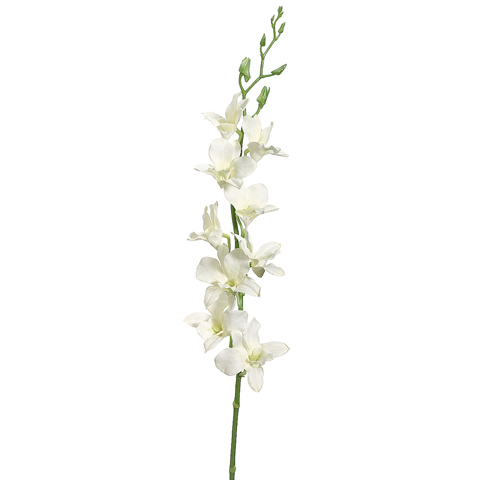 Stunningly beautiful, this 35.5" silk dendrobium orchid flower spray with it's natural-looking flowers will remain fresh for years together and never wilt or wither. Perfect for creating wedding bouquets, wreaths, potted arrangements, boutonnieres and so much more. You can use them alone in single stem flowers or in combinations of different types of stems to create that stunning arrangement you always wanted. This listing is for 1 pack. You will receive 12 items per pack, 1 item shown in picture. We classify our silk flowers as either a flower spray, flower stem, flower bush or a bridal bouquet. A flower spray and flower stem are actually the exact same thing, just worded differently, and have flowers attached to what looks like a single stem. A flower bush has multiple stems attached to a 4-6" non-decorative plug that can inserted into a pot filled with a medium of your choice. We don't recommend glass vases for flower bushes without a medium as you'll see the non-decorative plug at the bottom. Our flower bouquets, (sometimes also called bundles), contain multiple individual flower stems that can usually be taken apart if you'd like. We do our best to charge you exactly what we pay in shipping costs. To accomplish this our shipping costs are calculated by UPS using the total shipping dimensional weight of your order, not the actual weight, shipped from our warehouses zip code to your zip code. Shipping companies like UPS & FedEx DO NOT use the actual weight anymore. So an order of flowers may only weigh 5lbs, but the dimensional weight could easily be 10-40lbs depending on the size of the flowers. To determine your exact shipping fees please add the product(s) to your cart, then proceed to view your cart and then click on the button CALCULATE to enter in your state and zip code. If for any reason you feel your shipping total is inaccurate please contact us and we will investigate it immediately. Orders received between Monday and Friday by 1:00 pm ET will be processed the same day. Orders received after 1:00 pm ET will be processed the following business day. Business days do not include weekends or holidays. Priority shipments and items marked as being custom made cannot be altered or canceled under any circumstances. Please visit our shipping page for more information. At our site, returns are easy! You may return new and unused items for a full refund minus any shipping costs. Just notify us via email on our contact page within 7 days after receiving your purchase that you would like to return it. Please note that all returns must first be approved and pass all set guidlines explained on our return policy page. Are your product made out of silk? Please note the definition of the word SILK in the title does not mean the item is made out of silk. Keeping to industry standards the word SILK is now used to describe that a flower or plant is artificially made and does not mean that the material used is silk. Materials used may depend on the quality and the final shape requirements of the flower head or leaves and may include but are not limited to polyester, nylon, PVC, latex, rubber, and silk. Can I break a pack and only order 1 item? In order to provide our customers with the lowest possible price our items are sold in pack quantities only. If the item title and/or description of the item states 'pack of ...' then you are obligated to purchase the entire pack. You also cannot mix and match colors of the same product codes to equal pack quantity. Do you offer material or color samples? No we do not. We do our best to represent the product by showing a picture of the exact same item you will be receiving. If you require a sample then you will need to place an order for 1 pack and then you may return them if they don't work for your project. This would fall under our return policy. Do you offer any catalogs? No we do not. We have a current selection of about 12,000 items. Every single day there are dozens of items are discontinued and replaced with new items. A catalog cannot keep up with our inventory. Can they be put outdoors? Although our products CAN be used as outdoor decoration, it is not advised to hang or leave the flowers, trees, and plants in direct sunlight for any significant amount of time. This includes direct sunlight coming in through an indoor window. Most of our products are made out of materials that will eventually fade like any other fabric when left out in the sun. Please note, however, that they will last longer if put in the shade or on a porch where direct sunlight isn't a problem. Heavy rain and wind may also knock the fronds out of trunks or the materials may absorb rainwater causing items to look wilted and/or fall over. We do stock many product designed for exterior use. Although they do cost more, it's up to you to determine whether the cost of replacing a silk tree every year or two is worth the cost compared to one that is designed to never fade or deteriorate outdoors. Outdoor and/or Water Resistant in the title = Usually a PVC material that won't absorb water. Not UV resistant and will fade over time. UV-Resistant in the title = Usually but not always a PVC material with UV inhibitors that will delay fading for a minimum of 1 year. Depending on materials used will depend whether it will endure the ravages of rain and wind. UV-Proof in the title = Usually but not always a PVC material with UV inhibitors that will delay fading for a minimum of 5 years. Designed to withstand the ravages of sun fading, wind, rain, ice, snow, and people. How are your product heights or sizes measured? In keeping with industry standards, any flower, plant or tree that comes with a pot are measured from the bottom of the pot to the outstretched tip on the top. This simply means if you point the longest leaf or frond straight up, you measure the furthest most measurement. When we say an artificial tree is 6' high we are measuring from the bottom of the container or tree trunk to the top of the tree, extending the longest leaf or frond as we measure. For hanging baskets, for example, the length of the artificial flower or artificial plant is the longest hanging stem measured when it is fully extended. When we specify that a plant is 37" wide we measure the plant with the leaves or stems extended to the sides. Shaping these plants and trees will reduce the size. Please note that plant and tree heights are approximate. As they are hand made taller plants may vary a few inches in height. Floral arrangements are more exact as these are pre-arranged and do not change shape after being created. What's the difference between standard and handwrapped silk? Most artificially made flowers can be classified as either being a standard polysilk flower or handwrapped. Standard polysilk flowers are the most common and vary from your common economical fake flowers to very realistic replicas. Handwrapped flowers, on the other hand, tend to all be very high quality as they are attached to wires and bundled together and wrapped with paper floral tape on the stem to create a bush or spray. Polysilk, on the otherhand, are wired with plastic coating. How do I care for and maintain artificial flowers and plants? We recommend that artificial floral arrangements and artificial plants be dusted much the same as you dust your home or office. Most artificial plants can be wiped with a moist cloth if necessary. First test the plant with your tap water - remove one leaf from an inconspicuous portion of your artificial plant and rinse it with tap water then shake it out. After a few minutes, check the leaf to see if it's clean and the shine has returned. After your have tested your leaf, the best thing to do is to take the plant outside and dust it with a feather duster. This will remove most of the dust and prime your plant for cleaning. Cover your pot and filler with plastic for protection from the water. Make sure your silk plant is on a clean surface near a water hose. Use the spray nozzle on your hose. Spray your plant thoroughly with a light spray. When you're done, shake it lightly to get most of the water off and allow it to dry in the sun for a few hours. This is a good regimen to be done about ever 3 to 6 months. Between those times, we suggest that you use a good feather duster to keep your artificial plants looking fresh and new. Emails are usually replied within 24 hours, including weekends. Most times you should get an answer back within a few hours though. Your questions and concerns are very important to us and we will do our very best to reply back with a response as soon as we possibly can. Whenever possible, all shipments will be made via UPS Ground or FedEx Ground. Very few of our large items must be crated and shipped via common carrier. We currently only accept orders to any country that accepts UPS Canada or USPS Priority. Custom orders can use other shipping methods but they are usually very expensive. Any item marked as Free Shipping cannot be shipped internationally. We currently offer 2 shipping speeds for all international orders. Can I track my order after its been shipped? Most of our orders are shipped with a tracking number that we will send you a link to track. Your account will be updated and an email sent approximately 1-2 business days after your order has shipped. We accept payments through PayPal plus all major credit cards: VISA, MasterCard, Discover & American Express. We also accept payments through Bill Me Later which is now called PayPal Credit. Please see our return policy page. Our headquarters are located in Pennsylvania so we must collect taxes for shipments being delivered into Pennsylvania. If you are located in Pennsylvania and have a sales tax ID please fill out the appropriate form and email it to us. If the delivery address is in any other state we do not collect sales tax. Can we use our own UPS or FedEx shipping account? Yes. This is usually reserved for larger companies but we would be happy to use your shipping account number. Please just enter in your account number and account details win the customer notes field on the checkout page. You will still be billed the shipping charges initially but we will credit them back when your package ships. Please note there is a $10 shipping fee for all Priority shipments that will not be reimbursed. Please note the definition of the word "SILK" in the title or description, if used, does not mean the item is made out of silk. Silk flowers, silk plants & silk trees were named this over a hundred years ago when they were originally sewn with silk. While we still label them as "SILK", the current manufacturing methods use synthetic fibers and/or high-tech processes to create botanically accurate, realistic reproductions. Unless otherwise stated, all measurements given for any potted item are measured from the bottom of the pot to the outstretched tip. This simply means if you point the longest leaf or frond straight up, you measure the furthest most measurement. Anything that is not potted is measured from the bottom of the stem to the tip of the furthest point. Any other items are always outside measurements, taking the tallest or widest measurement possible. Floral arrangements are more exact as these are pre-arranged and do not change shape after being created.